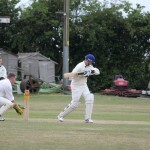 The runs continued to flow at SCC on Sunday in another high scoring game. 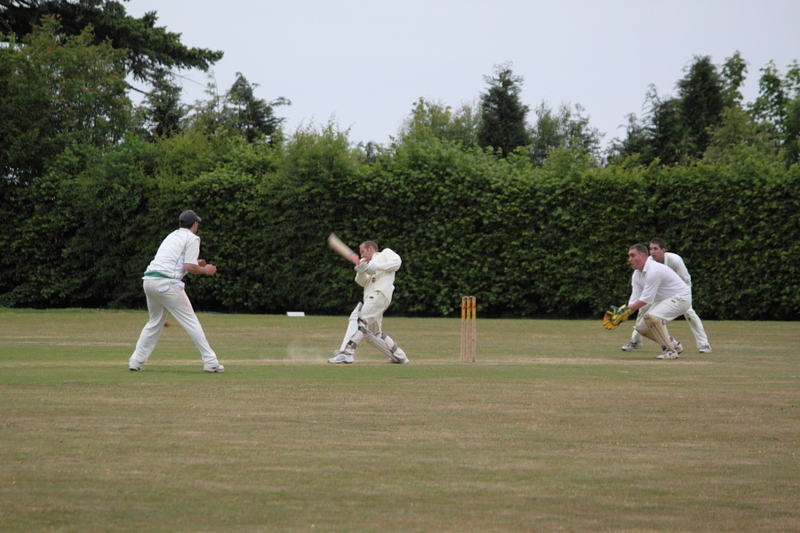 Shah won the toss and decided to have a bowl, but hadn’t counted on Robert Miller launching an early attack on the Saltwood bowlers. 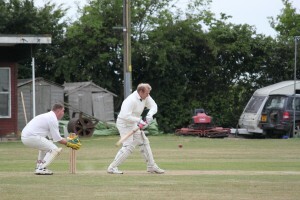 By the time Miller (43) finally fell to Shaun Carey, his opening partner Matt W had notched up just 8 runs. 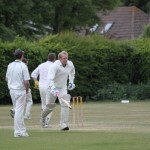 Brookland lost the toss so Moxo chose to bat – Joey & Tom were raiding Tescos to put together an emergency tea! 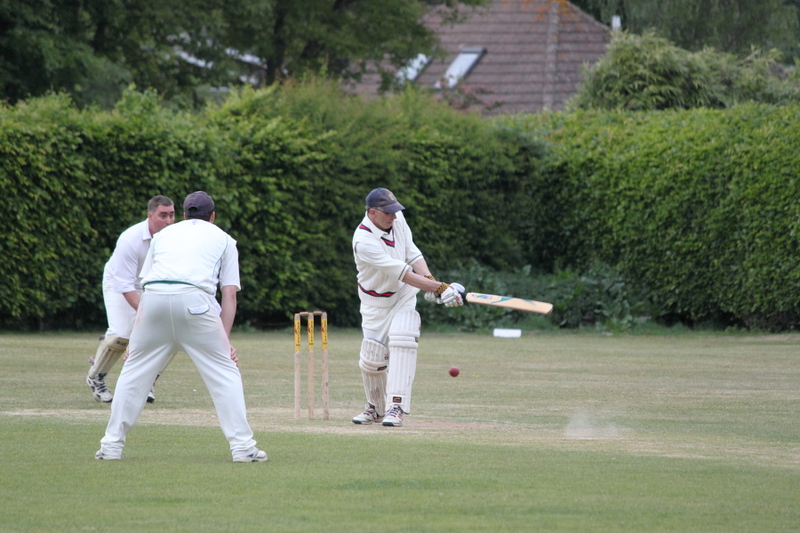 We opened with Jezza and Biff and they steadily upped the run rate until it hit 5 an over for a while, but all good things have to end and this came in the 15th over when Jezza was caught for 18 – 63 for 1. 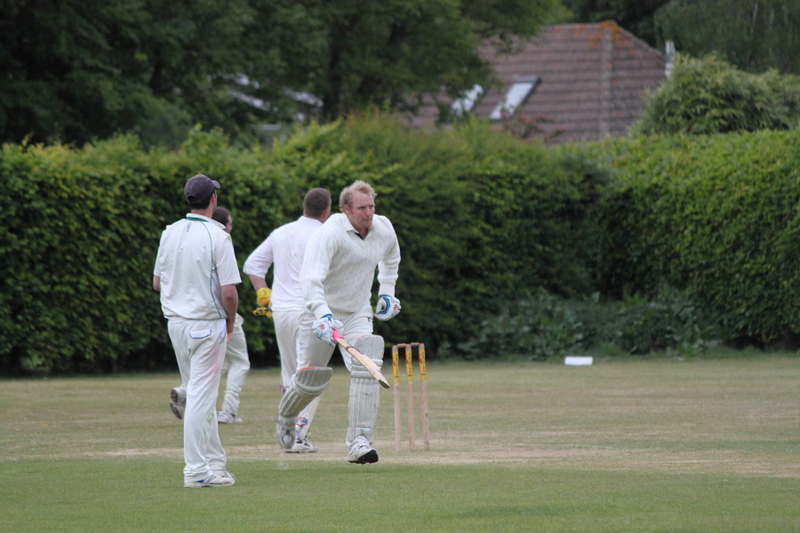 Lewso in at 3, hitting 9 off 13 and then being bowled – 81 for 2 off 19 – Biff on 48. 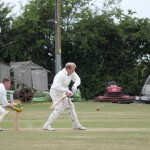 Shaun joined Biff who notched his 50 2 overs later, but having got to 60 he succumbed to a father/son combination, being caught in the 24th over – 99 for 3. Sadly this was the start of a Wood collapse, not helped by some very erratic calling which surprisingly only brought about one run out (Amanda for 2). 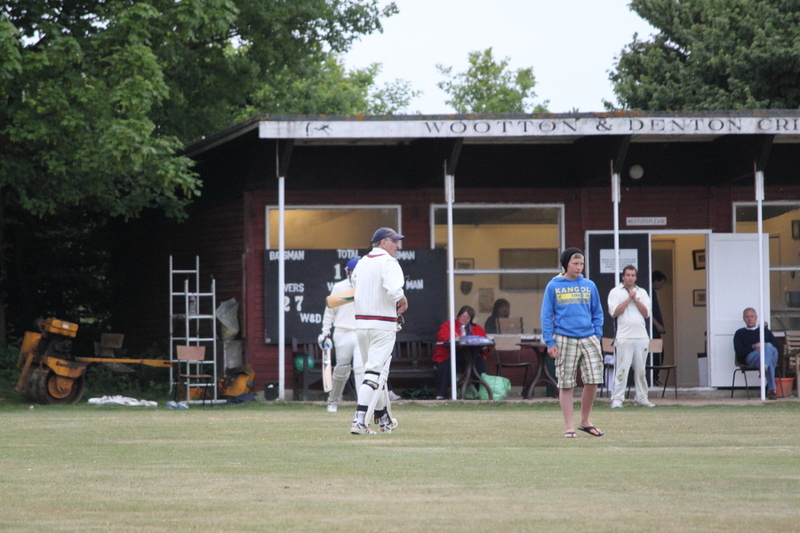 The only other batsman to reach double figures was Moxo who got to 19 and the Wood were all out for 151 (9 short of a batting point) – El Presidente being the 10th wicket to fall in the 38th over. The Joey/Tom tea was a great success so huge thanks to them, also to Moxo’s mum and dad who kindly washed up afterwards. 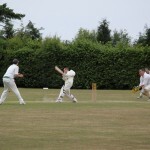 Biff and Tom opened the bowling for us but could not break the opening partnership. 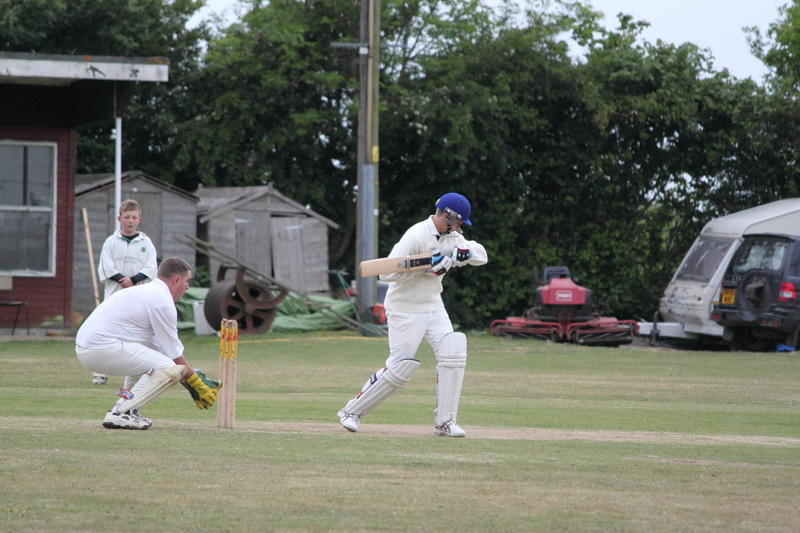 The introduction of El P finally made the breakthrough, getting an LBW decision from Brookland’s umpire – 104 for 1 off 18. 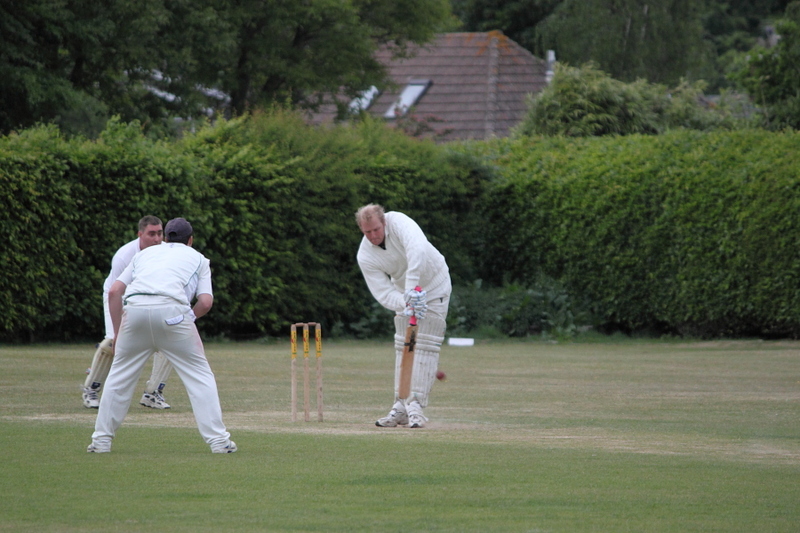 This second wicket partnership almost made it to the finish but El P struck again in the 24th over, bowling the No. 3 for 26 with only 4 needed to win. 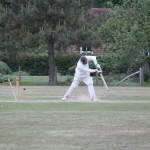 These were duly hit by Stanley the other opener who finished not out on 69. 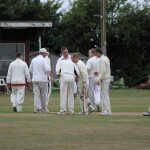 A rather comprehensive 8 wicket win in 24.1 overs. 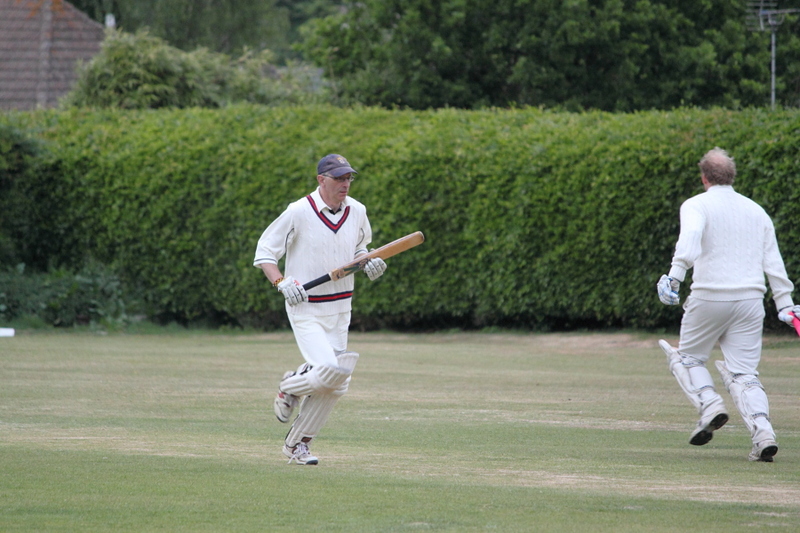 A mention for Big T who made some very useful stops in the field without which we would have finished even sooner and Biff who almost pulled off a diving one-handed catch but couldn’t quite hold onto it. Walking from the cars to the Pavilion was not encouraging, the pitch did not look as though it was going to help our cause. 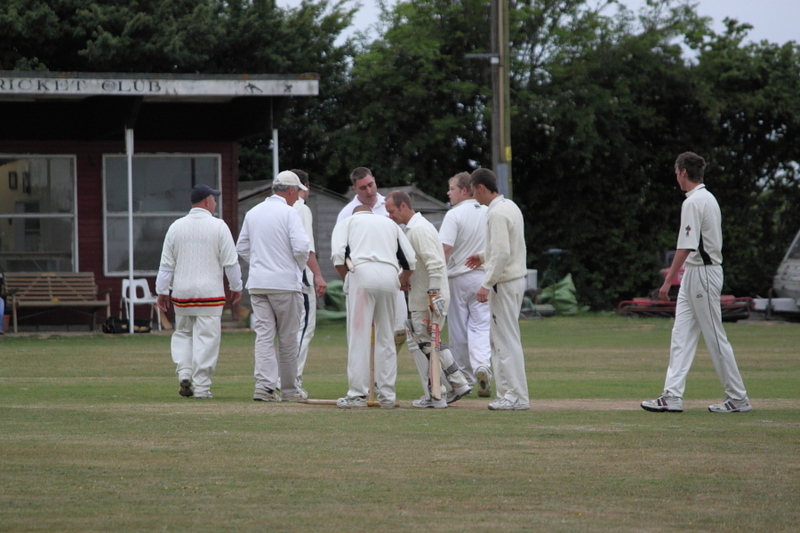 We lost the toss with W&D chosing to bat first and we opened with Reedy and Macca. With the scoring rate nearing double figures a bowling change was quickly made, Baz replacing Reedy, and W&D settled slightly at 8 an over. 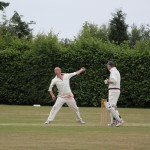 Macca struck in the 8th over, bowling his victim for 31 – 61 for 1. 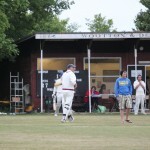 It was another 11 overs before the next wicket was taken, Baz getting an LBW decision from Cookie – 108 for 2 off 19. 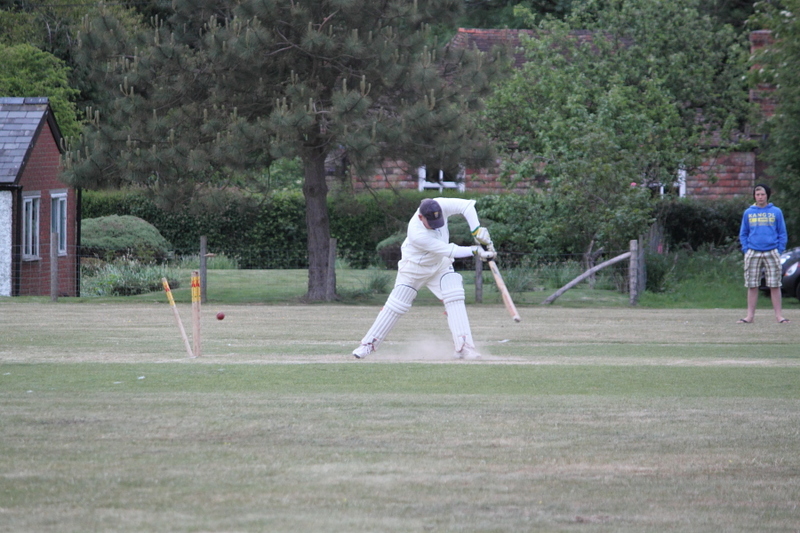 Hemang replaced Macca and it was not long before this change brought reward as he bowled the No. 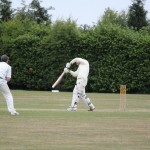 4 for 2 – 115 for 3 off 22. 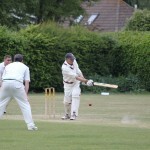 He struck again with a Macca catch – 132 for 4 off 26 but the other opener was still going strong, having now reached 53. G had now replaced Baz but it was Hemang who struck again, this time Oakesy taking the catch, 184 for 5 off 32. 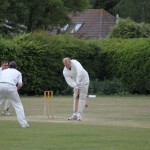 His final wicket came in the 34th over when he bowled the opener for 82 – 186 for 6. 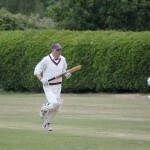 G got in on the act then, bowling both batsmen – 195 for 7 off 35 and then 209 for 8 off 39. W&D finished on 213 for 8 off their 40 overs with the Wood not having such a good day in the field with catches being missed and several fielding errors although the uneven pitch did not help. G and Shaun opened the batting for us building steadily until they were scoring at 5 an over but Shaun was bowled for 23 in the 12th over with the score on 57. 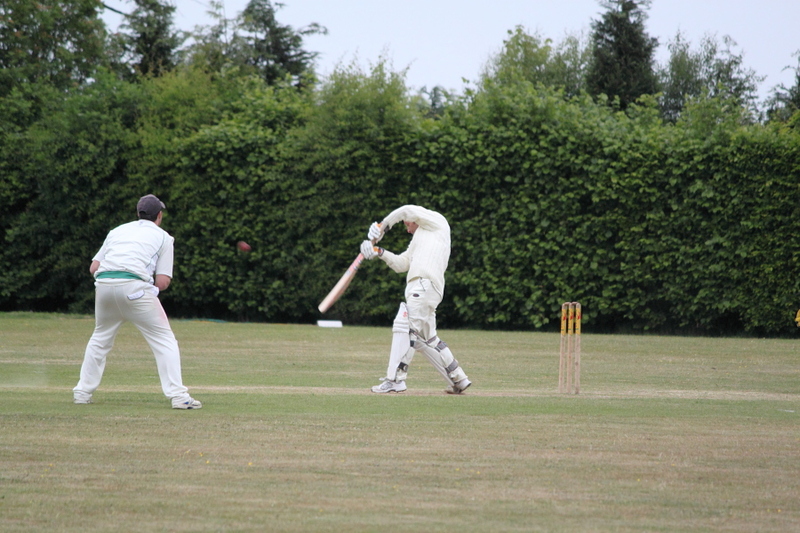 G was next to go, out LBW for 27 – 65 for 2 off 17. 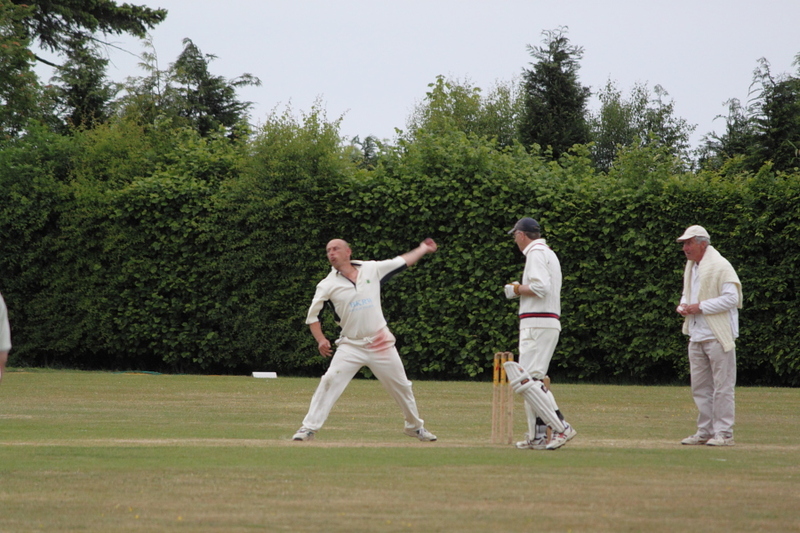 Hall was caught for a duck – 70 for 3 off 19 and when Baz was bowled for 19 in the 24th over – 95 for 4 – the rot set in with wickets going in successive overs, finishing with 2 in the 29th and we were all out for 108! A rather sorry tale after the good result on Saturday.